(Nanowerk News) Natural materials have extraordinary mechanical properties, which are based on sophisticated arrangements and combinations of multiple building blocks. 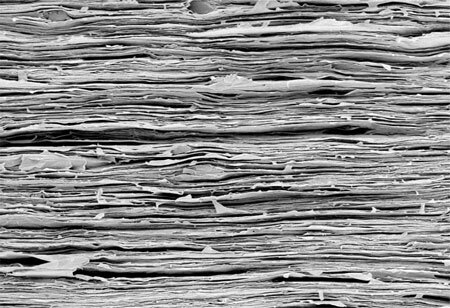 One key aspect of today’s materials research therefore is to develop bio-inspired materials reaching to the properties of natural materials – or even exceeding those in certain functionalities. The Walther group at DWI now prepared a nacre-inspired nanocomposite that combines exceptional mechanical properties with glass-like transparency and a high gas- and fire-barrier (Nature Communications, "Nacre-Mimetics with Synthetic Nanoclays up to Ultrahigh Aspect Ratios"). The structure of nacre resembles a brick wall at the microscopic scale: Calcium carbonate platelets (‘bricks’) alternate with soft biopolymer layers (‘mortar’). While the solid platelets serve as the load bearing and reinforcing part, energy can be dissipated into the soft polymer segments. Together, this results in a lightweight material that is considered as the gold standard of natural materials since it is both remarkably stiff and tough, a combination of features that is hard to realize in synthetic materials. Previous approaches to synthesize nacre-mimetics were not feasible on the large scale due to energy-intensive and laborious multistep procedures. Also, it was not possible to synthesize transparent nacre-mimetic films and foils. Andreas Walther and his team decided to use synthetic nanoclays for their nacre-mimetic materials. This significantly improved the material’s transparency. The Aachen-based research group also refined the underlying preparation procedure: “Mussels grow nacre in a lengthy process. For our nanocomposites, we instead apply a rapid self-assembly process,“ the chemist explains. First, the researchers coat the clays with a layer of polyvinylalcohol (‘mortar on the brick’) and subsequently, these core/shell particles self-assemble into a thin film upon water removal. The whole procedure takes less then 24 hours. To learn more about how the dimensions of the nanoclays influence the characteristics of the resulting nano-composite, Walther and colleagues compared nanoplatelets of different size. “The nacre-mimetics based on small clays are very tough. However, if we use large clays with an aspect ratio of 3500, the resulting nacre-mimetics are both extremely stiff and strong. Their mechanical properties actually reach close to those of fiber composites, which are far more laborious to prepare,“ says PhD student Paramita Das. The glass-like transparency and the high gas barrier of the nanocomposite are an extra benefit of the material. This outstanding combination of features makes the nacre-mimetic material a promising candidate for future applications, not only as a structural material, but also for gas storage applications and food packaging. In addition, it may be used as an advanced substrate and for encapsulation of oxygen-sensitive organic electronics in flexible displays.